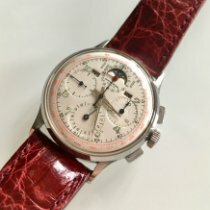 A beautiful condition Universal Geneve Tri Compax chronograph featuring an annual calendar and moonphase. The 36mm case is in pristine conditions with sharp and even lugs and beautiful crisp engraving on the caseback. The opaline dial is in overall fine conditions besides an aging mark by the moon phase overture. The manual wind movement is running fine and the chronograph starts, stops and resets with no issues. A fine Universal for the finest collections.